At LeBrun Toyota we not only want to help you find the perfect car, we want to help you find the perfect used car at a deal you can’t resist. Browse through our selection of used car specials to see where you could save on your next vehicle purchase. If you’re in search of a used car near Rochester, Fairport or any other surrounding town, we invite you to see what we have to offer that other Toyota dealers don’t! While you’re at it, don’t forget to check out our full selection of used cars for sale. With any questions, fill out our contact form, give us a call or come personally visit our Canandaigua car dealership. IIHS Top Safety Pick. Boasts 22 Highway MPG and 17 City MPG! This Toyota Highlander boasts a Gas V6 3.5L/211 engine powering this Automatic transmission. Woodgrain-style interior trim -inc: chrome door handles, Washer-linked variable intermittent windshield wipers -inc: windshield wiper de-icer, UV reduction glass windshield. *This Toyota Highlander Comes Equipped with These Options *Traction control (TRAC), Tonneau cover, Smart Key System -inc: push button start, remote illuminated entry, Side-impact door beams, Rear window defogger, Rear privacy glass, Rear intermittent wiper, Rear glass hatch, Pwr windows -inc: driver auto up/down, jam protection, Pwr ventilated front/solid rear disc brakes. * This Toyota Highlander is a Superstar! *IIHS Top Safety Pick, KBB.com Best Resale Value Awards. * See What the Experts Say! *As reported by KBB.com: There are plenty of midsize crossover SUVs worthy of owning, but when you combine the 2012 Toyota Highlander crossover's wide model range, exceptional resale value and strong owner-satisfaction figures, it gets a bit harder to justify buying anything else. * Stop By Today *A short visit to LeBrun Toyota located at 2435 Route 332, Canandaigua, NY 14424 can get you a trustworthy Highlander today!Get Toyota reliability at a great price. Contact Nicholas Easton with a call/text/facetime at 585-301-0677 or at nicholas@lebruntoyota.com to schedule your test drive today! Interested in more pictures? Want a video of the vehicle? Any further questions? JUST ASK! Your first oil change is free within the next year/15,000 miles. 1 Year/15,000 miles of complimentary roadside assistance for all used vehicles sold from LeBrun Toyota. As always every vehicle we sell retail comes with a 6 month/6,000 mile limited warranty. KBB.com 5-Year Cost to Own Awards. Boasts 37 Highway MPG and 29 City MPG! This Toyota Corolla boasts a Regular Unleaded I-4 1.8 L/110 engine powering this Automatic transmission. Wheels: 17 x 7.0 Alloy, Urethane Gear Shift Knob, Trunk Rear Cargo Access. * This Toyota Corolla Features the Following Options *Trip Computer, Transmission: Continuously Variable (CVTi-S), Transmission w/Driver Selectable Mode and Sequential Shift Control w/Steering Wheel Controls, Torsion Beam Rear Suspension w/Coil Springs, Tires: P215/45R17 All-Season, Strut Front Suspension w/Coil Springs, Steel Spare Wheel, Sport Fabric Seat Trim -inc: sport bolsters and sport inserts, Single Stainless Steel Exhaust w/Chrome Tailpipe Finisher, Side Impact Beams. * This Toyota Corolla is a Superstar! *KBB.com 5-Year Cost to Own Awards, KBB.com Best Buy Awards Finalist. * Stop By Today *A short visit to LeBrun Toyota located at 2435 Route 332, Canandaigua, NY 14424 can get you a tried-and-true Corolla today!Get Toyota reliability at a great price. Contact Nicholas Easton with a call/text/facetime at 585-301-0677 or at nicholas@lebruntoyota.com to schedule your test drive today! Interested in more pictures? Want a video of the vehicle? Any further questions? JUST ASK! Your first oil change is free within the next year/15,000 miles. 1 Year/15,000 miles of complimentary roadside assistance for all used vehicles sold from LeBrun Toyota. As always every vehicle we sell retail comes with a 6 month/6,000 mile limited warranty. IIHS Top Safety Pick+. Boasts 24 Highway MPG and 18 City MPG! This Toyota Highlander boasts a Regular Unleaded V-6 3.5 L/211 engine powering this Automatic transmission. Window Grid Diversity Antenna, Wheels: 18 Split 5-Spoke Machined-Face Alloy, Wheels w/Machined Accents. * This Toyota Highlander Features the Following Options *Variable Intermittent Wipers w/Heated Wiper Park, Valet Function, Trunk/Hatch Auto-Latch, Trip Computer, Transmission: Electronic 6-Speed Automatic w/OD -inc: ECT-i, sequential shift mode and snow mode, Transmission w/Oil Cooler, Towing Equipment -inc: Harness, Tires: P245/60R18 105S AS, Tailgate/Rear Door Lock Included w/Power Door Locks, Systems Monitor. * The Votes are Counted *IIHS Top Safety Pick+, KBB.com 15 Best Family Cars, KBB.com Best Buy Awards, KBB.com 10 Most Fuel-Efficient SUVs. * Expert Reviews! *As reported by KBB.com: The 2015 Toyota Highlander is a safe choice, for all the right reasons. Comfortable, accommodating and feature-packed, with a variety of models for all budgets, the Highlander's a tough act to follow. * Visit Us Today *Test drive this must-see, must-drive, must-own beauty today at LeBrun Toyota, 2435 Route 332, Canandaigua, NY 14424.Get Toyota reliability at a great price. Contact Nicholas Easton with a call/text/facetime at 585-301-0677 or at nicholas@lebruntoyota.com to schedule your test drive today! Interested in more pictures? Want a video of the vehicle? Any further questions? JUST ASK! Your first oil change is free within the next year/15,000 miles. 1 Year/15,000 miles of complimentary roadside assistance for all used vehicles sold from LeBrun Toyota. As always every vehicle we sell retail comes with a 6 month/6,000 mile limited warranty. KBB.com Best Resale Value Awards. Scores 25 Highway MPG and 18 City MPG! This Toyota Sienna delivers a Regular Unleaded V-6 3.5 L/211 engine powering this Automatic transmission. Window Grid And Roof Mount Diversity Antenna, Wheels: 17 x 7 5-Spoke Alloy, Vinyl Door Trim Insert. * This Toyota Sienna Features the Following Options *Variable Intermittent Wipers w/Heated Wiper Park, Valet Function, Urethane Gear Shift Knob, Trip Computer, Transmission: Electronic 6-Speed Automatic w/OD, Transmission w/Sequential Shift Control, Torsion Beam Rear Suspension w/Coil Springs, Tires: P235/60R17 AS, Tailgate/Rear Door Lock Included w/Power Door Locks, Strut Front Suspension w/Coil Springs. * This Toyota Sienna is a Superstar! *KBB.com Best Resale Value Awards, KBB.com 15 Best Family Cars. * The Experts' Verdict...*As reported by The Manufacturer Summary: Families always have somewhere to go, and the Toyota Sienna can help you keep up. It is a stylish choice designed as much for parents as it is for the kids, as it has a forward-leaning, athletic stance, with aerodynamic and attractive body sculpting. It handles more like a performance car and less like the people movers you might be used to. Available in five models: L, LE, SE, XLE and Limited, all share a 3.5L 266hp V6 engine paired with a 6-speed automatic Transmission. All models come standard with Front-wheel drive, but All-Wheel Drive is an available option on the LE, XLE and Limited trims. The FWD gets an EPA estimated 18 MPG City and 25 MPG hwy, and the AWD gets 16 MPG City and 23 MPG hwy. Depending on Trim, the Sienna can hold 7-8 people as a two-wheel drive, and 7 if you get all-wheel drive. Based on seating configurations and how many people are in the vehicle, cargo room in the Sienna varies from over 39 cubic feet up to 150 cubic feet. The base L Trim comes generously appointed with items like Dual Sliding Side Doors, a 60/40 Split and Stow 3rd Row seat, Three-zone air conditioning, and Cruise control. Based on which you select, the higher trims can offer possibilities like a Sport mesh front grille, Power lift gate, and Perforated leather-trimmed seats. Plus, the optional Display Navigation with Entune App Suite is available. It includes a 6.1-inch touch-screen with integrated backup camera display, HD Radio, auxiliary audio jack, hands-free phone capability, and music streaming via Bluetooth. Also, available are apps like Bing, OpenTable, Pandora, and real-time info like traffic, weather, and fuel prices. Another great option is the incredible Dual-View Entertainment Center with 16.4-in. display. 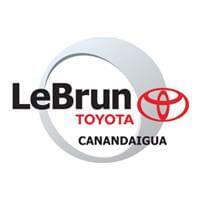 * Stop By Today *Stop by LeBrun Toyota located at 2435 Route 332, Canandaigua, NY 14424 for a quick visit and a great vehicle!Get Toyota reliability at a great price. Contact Nicholas Easton with a call/text/facetime at 585-301-0677 or at nicholas@lebruntoyota.com to schedule your test drive today! Interested in more pictures? Want a video of the vehicle? Any further questions? JUST ASK! Your first oil change is free within the next year/15,000 miles. 1 Year/15,000 miles of complimentary roadside assistance for all used vehicles sold from LeBrun Toyota. As always every vehicle we sell retail comes with a 6 month/6,000 mile limited warranty. IIHS Top Safety Pick+. Boasts 31 Highway MPG and 34 City MPG! This Toyota RAV4 Hybrid delivers a Gas/Electric I-4 2.5 L/152 engine powering this Variable transmission. Wheels: 18 x 7.5J Alloy ALM -inc: caps, Variable Intermittent Wipers, Valet Function. * This Toyota RAV4 Hybrid Features the Following Options *Trunk/Hatch Auto-Latch, Trip Computer, Transmission: CVT (Continuously Variable), Transmission w/Driver Selectable Mode, Sequential Shift Control and Oil Cooler, Towing Equipment -inc: Trailer Sway Control, Tires: P235/55R18H AS, Tailgate/Rear Door Lock Included w/Power Door Locks, Strut Front Suspension w/Coil Springs, Steel Spare Wheel, Split-Bench Front Facing Rear Seat. * Stop By Today *A short visit to LeBrun Toyota located at 2435 Route 332, Canandaigua, NY 14424 can get you a dependable RAV4 Hybrid today!Get Toyota reliability at a great price. Contact Nicholas Easton with a call/text/facetime at 585-301-0677 or at nicholas@lebruntoyota.com to schedule your test drive today! Interested in more pictures? Want a video of the vehicle? Any further questions? JUST ASK! Your first oil change is free within the next year/15,000 miles. 1 Year/15,000 miles of complimentary roadside assistance for all used vehicles sold from LeBrun Toyota. As always every vehicle we sell retail comes with a 6 month/6,000 mile limited warranty. ALG Residual Value Awards. Scores 20 Highway MPG and 17 City MPG! This Toyota FJ Cruiser delivers a Regular Unleaded V-6 4.0 L/241 engine powering this Automatic transmission. UPGRADE PACKAGE -inc: 120V/400 watt AC power outlet and transfer lever w/silver accents, Locking Rear Differential Electronically controlled, Active Traction Control (A-TRAC), JBL Audio w/10 Speakers & Subwoofer, 6-disc CD changer, Garage Door Opener, Multi-Information Display Floating ball, Compass & Outside Temperature Gauge, Inclinometer, Wheels: 17 Alloy, fullsize alloy spare, Leather-Trimmed Steering Wheel, Exterior Color-Keyed Door Trim Inserts, Rear Parking Assist Sonar, CONVENIENCE PACKAGE -inc: Power Aluminum Outside Rear View Mirror, illuminated markers, Cruise Control, Remote Keyless Entry System, Spare Tire Cover, Auto-Dimming Rearview Mirror w/Backup Camera, integrated backup camera monitor, Rear Wiper, Rear Privacy Glass On rear side, quarter and rear door windows, ROOF RACK. * This Toyota FJ Cruiser Features the Following Options *Variable Intermittent Wipers, Valet Function, Urethane Gear Shift Knob, Transmission: ECT 5-Speed Automatic, Tires: P265/70R17 BW -inc: Mud and snow rated steel-belted radial, full size spare tire (back door mount), Tailgate/Rear Door Lock Included w/Power Door Locks, Steel Spare Wheel, Split-Bench Front Facing Rear Seat, Splash Guards, Single Stainless Steel Exhaust. * This Toyota FJ Cruiser is a Superstar! *ALG Residual Value Awards, KBB.com Best Resale Value Awards. * The Experts' Verdict...*As reported by KBB.com: For a fairly hard-core weekend off-road warrior, the FJ makes an entirely reasonable daily driver, and you really can live with it day-in, day-out. Few others will match that blend as well. * Visit Us Today *A short visit to LeBrun Toyota located at 2435 Route 332, Canandaigua, NY 14424 can get you a trustworthy FJ Cruiser today!Get Toyota reliability at a great price. Contact Nicholas Easton with a call/text/facetime at 585-301-0677 or at nicholas@lebruntoyota.com to schedule your test drive today! Interested in more pictures? Want a video of the vehicle? Any further questions? JUST ASK! Your first oil change is free within the next year/15,000 miles. 1 Year/15,000 miles of complimentary roadside assistance for all used vehicles sold from LeBrun Toyota. As always every vehicle we sell retail comes with a 6 month/6,000 mile limited warranty.